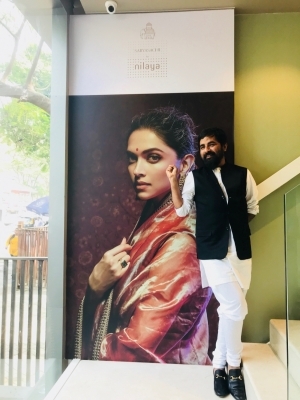 Mumbai, Nov 21 (IANS) Ace designer Sabyasachi Mukherjee has clarified on social media that Deepika Padukone's sari for her wedding with actor Ranveer Singh was given to him by the actress's mother Ujjala Padukone. Sabyasachi had previously claimed that the red and gold sari for Deepika's Konkani style wedding at the picturesque Lake Como in Italy was designed by the couturier himself. However on Wednesday, Sabyasachi took to Instagram and said that the sari was a gift to Deepika by her mother, which was handed over to the designer. "As per Konkani tradition, the bride's sari is gifted to her by the mother for her wedding. Deepika's wedding sari was given to us by her mother -- Mrs Ujjala Padukone. We have just received that the sari was bought from Angadi Galleria, Bengaluru and we would like to give them due credit for the same," he wrote. But Sabyasachi's clarification did not go well with Deepika's fans as they started trolling the designer. This is not the first time Sabyasachi forgot giving credits. Last year, at the time of Virat Kohli and Bollywood actress Anushka Sharma's wedding reception the designer took credit for the Indian skipper's outfit, which was designed by Raghavendra Rathore. Later Sabyasachi came out with a clarification that they had designed a similar outfit earlier which led to confusion.